Villa Vrysoulla has been cleverly designed to make the most of its wonderful hillside and sea views. The L-shaped infinity pool sits to one side whilst the spacious sea-facing dining terrace is the perfect place to enjoy a BBQ! You can also see the top of Mount Pantokrator behind the house. It's only 5 minutes' drive into Nissaki which has several shops and tavernas, a picturesque beach and a quaint little harbour. Air conditioning/heating in the bedrooms, pool heating and WiFi are included. It has to be the wonderful views of the hills and open sea, as well as Mount Pantokrator - simply stunning! Villa Vrysoulla has a fantastic exterior space, perfect for relaxing and taking in the marvellous scenery. Its private infinity swimming pool sits beside the villa, maximising the view from both the pool and the house. There's a partially covered terrace stretching the entire length of the villa, with a table and chairs, as well as a brick BBQ and seating area. 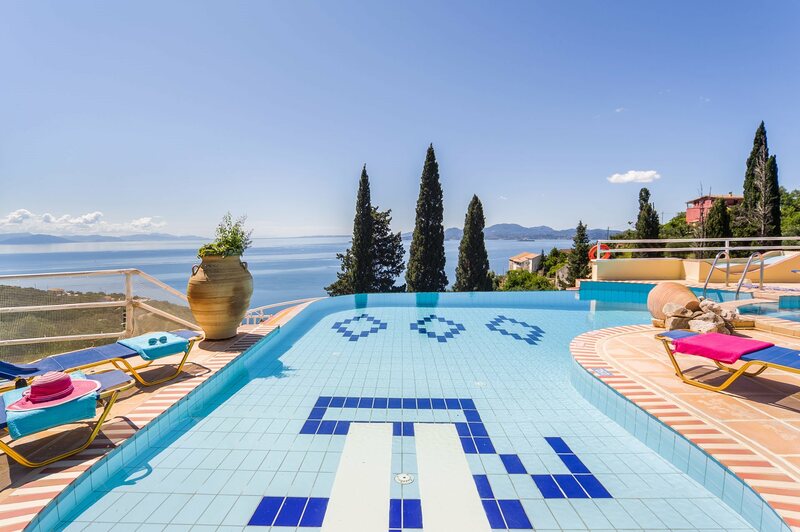 The pool and terrace overlook the Nissaki hillside and across the open water, whilst behind the villa, Corfu's highest point, Mount Pantokrator, can be seen. Large double gates open onto a sloped private driveway at the front of Villa Vrysoulla, with plenty of space to park your hire cars. The entrance to the villa is right by the parking area. The living space combines the lounge, dining area and well-equipped kitchen. A stylish red corner sofa and built-in bench seating surround the impressive ornamental marble fireplace and flat screen TV, and there's a table and chairs for dining. Two sets of patio doors frame the wonderful sea view and open directly onto the pool terrace. Patio doors at the front also back onto the driveway. Villa Vrysoulla has 3 sea-facing bedrooms spread over 2 levels. On the ground floor is a double bedroom with en suite shower room, a twin bedroom and a separate shower room. Both bedrooms have patio doors onto the dining terrace, leading to the pool. Upstairs is a second twin bedroom with an en suite bathroom and a spacious private balcony, which has the best view in the house! This villa is registered and licenced by EOT Greek licensing association. This number is: 0829K91000387001. Villa Vrysoulla sits at the base of Mount Pantokrator, above the quaint Greek resort of Nissaki. A pleasant 5 minute drive down through the surrounding countryside brings you to the beach, harbour and amenities of the village. Plus, several larger bays, attractions and towns are within a short distance by car. Motorboats can be hired locally if you fancy exploring Corfu's hidden coves only accessible by sea, as well as group boating excursions. There's plenty to see and do in the area, all making for an enjoyable holiday! Nissaki has a small but good selection of gift shops to browse, as well as mini markets where you can pick up daily essentials and BBQ supplies. Serious shoppers should head to Corfu Town which has a wonderful market, various gift shops and high street boutiques. This popular resort has a few excellent tavernas near to the beach, as well as one right on the seafront. Any of the other resorts along this stretch of coast will also have several great restaurants if you fancy a change of scenery. The closest bay to the villa is Nissaki's small but picturesque shingle beach, which has a couple of great tavernas where you can enjoy a drink or light lunch. Several alternative beaches are within a short drive in either direction, including the larger beaches of Kaminaki, Barbati and Krouzeri. There are many attractions and places to see within a short drive, including Mount Pantokrator - Corfu's highest point - or Paleokastritsa which offer stunning scenic views. There are also various small, quaint Greek villages to explore. Why not hire a motorboat locally and venture along the coast from the sea? You can stop at Agni for a spot of light lunch or Kalami to see the former residence of Lawrence and Gerald Durrell. You can even visit Corfu Town! Villa Vrysoulla is not available to book for season as it is sold out. Take a look here at the Corfu villas that are currently on sale. This is a superb villa with a magnificent view. Beautiful surroundings. Very clean, well kept and really well equiped. The owner is really a wonderful person who ensures that everything is perfect and gave us a lot of good information. To conclude, "dream" villa and holidays. The perfect villa to relax and let the world go by. Great vista views of Corfu town and beyond. Villa spacious and immaculate with great interior design. Staff very attentive but not obtrusive. The drive up is steep but rewards are the wonderful views so well worth the climb! Highly recommended.